This “State of the Union” address, held commonly in January and in front of both chambers of Congress in a joint session, is carried by many U.S. television networks and radio stations and also broadly distributed on the web and social media. It’s how the political America rings in the new calendar year, and it’s where the president looks back and looks ahead, with the people across the country watching and forming an opinion. And quite obviously, the people are interested how others think about the speech and how the president did, aligned and unaligned with their own political leanings. For this year’s State of the Union address by President Obama, television networks CNN, MSNBC, and Telemundo, along with their web and mobile properties took the people’s pulse with Microsoft Pulse. Microsoft Pulse is a highly scalable service built to capture the mood and opinion of very large audiences in real time. It can be integrated with mobile apps and websites, and can capture and process hundreds of thousands of votes from the audience concurrently in addition to reporting back results in near real time. 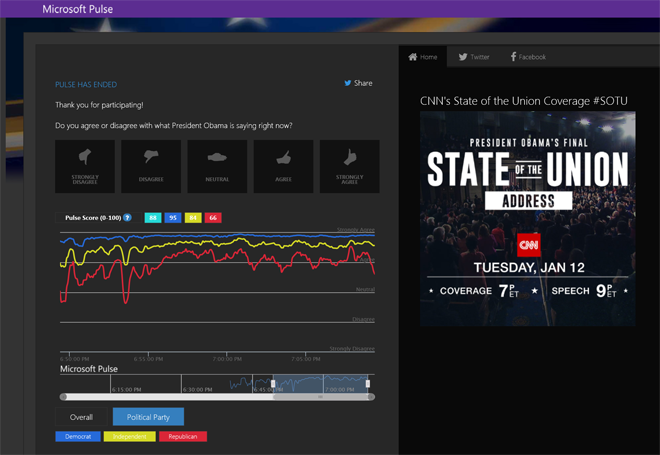 During the hour of the President’s speech, over six million opinion votes of approval or disapproval were collected and tallied by Microsoft Pulse across all the networks listed. The service collects and processes each incoming vote in a matter of milliseconds, while rolling up and feeding back the real-time sentiment result data back not only into the live television broadcasts, but also to all viewers connected to the networks' web properties. Microsoft Pulse’s “magic trick” to achieve this scale and throughput is Azure Event Hubs, which acts as the front door for Pulse and directly accepts all submitted votes through HTTP, insulating the Pulse service itself from extreme traffic spikes, while reliably accepting the viewer’s votes. Microsoft Pulse directs traffic to be distributed across three Event Hubs located in the US East, Central, and West datacenter regions, providing high throughput and high availability. During State of the Union address, the reliability and availability of three Event Hubs was reported as 100%, meaning every single one of the six million votes cast counted towards the results. As Microsoft Pulse prepared for the event, the test loads were giving ample safety margin, with up to 300,000 concurrent votes cast, up to a total of 140 million votes per test run. Azure Event Hubs were processing over 20 million messages per minute at peak across the three Event Hubs during testing and with perfect reliability, demonstrating readiness for even bigger and global audience events. Learn more about Microsoft Pulse at microsoft.com/pulse/. To get started building your own large scale analytics services, learn about Azure Event Hubs as the super-highway for large scale data ingestion and the Cortana Analytics Suite for turning data into insights.